Eyewitnesses say the impact blew the big-rig’s cab off into the opposite lanes of traffic. Highway Patrol Trooper Jerril Ren tells Montana Public Radio that the truck driver, who has not been identified, is listed in serious condition at St. Patrick Hospital. 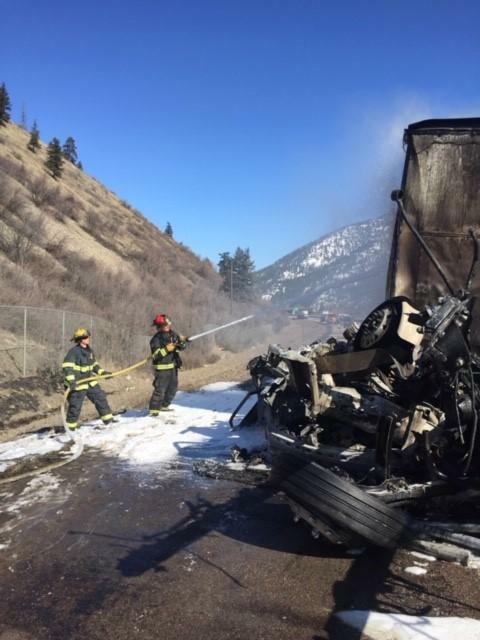 Firefighters spray a semi truck in the aftermath of a head-on collision on I-90 near Missoula, March 20, 2019. "He did strike another vehicle seconds before the significant fatality crash. He sideswiped the side of a semi. The semi had minor damage. We don’t know what kind of damage the suspect vehicle sustained." "We don’t know exactly what caused the individual to do what he did; it’s not even certain that we will know what made him do that. We have speculation, but right now it’s still under investigation," Ren says. Trooper Ren says that accident scene was a first for him. "I have not seen anything quite that explosive before." The truck Elison hit was hauling wood chips and caught fire right after the collision. Eyewitnesses described an explosion after the impact. One person was killed in a head-on collision this afternoon just east of Missoula. Traffic was snarled for hours after a vehicle traveling the wrong way on Interstate-90 struck a semi-tractor trailer hauling wood chips. A couple of hundred Missoula high school students walked out of class today, demanding tough action on climate change. "It’s a huge deal!" says Big Sky High School Senior Cassie Farago.